Last month, I flew to London to style the Summer campaign for DFS which took place in a magical place in Seasalter, Kent. As the photos have been featured in the press, I’m now allowed to share them with you here. The brief from DFS was to achieve a costal look around this beautiful sofa which is part of the French Connection collection (the coffee table too is from DFS, stunning isn’t it!?). I wanted to stay away from the costal shabby chic look we often see in magazines so my inspiration for the photoshoot was the beach houses that line the coast of Cape Town in South Africa and the location was just perfect for this! 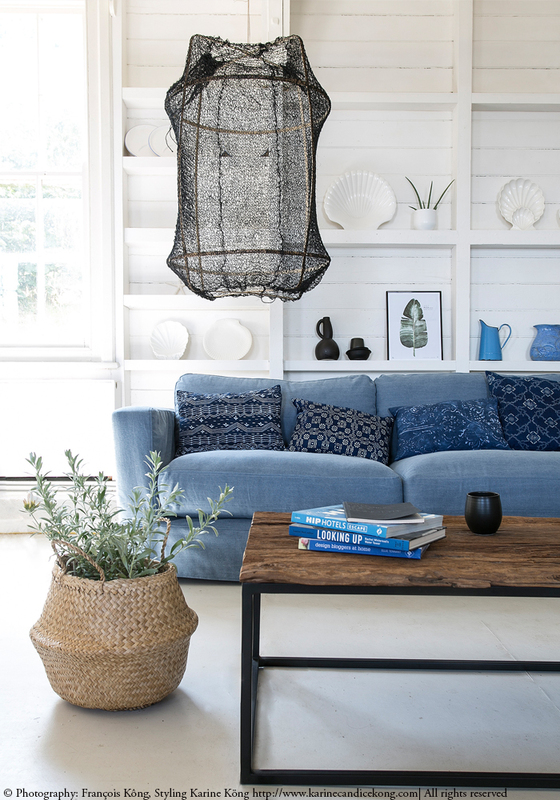 To achieve the look, I introduced textures using the striking Z1 pendant light with a black sisal shade as a centre piece to complement the blue of the sofa and this pretty basket and added soft furnishings with patterns using handmade indigo throws and cushions. PS: If you havent heard yet, I have been nominated for the 2015 Amara interior Blog Award for Best Organisation Blog which I’m really happy about! This blog is unique and beautifully organized. It deserves to be rewarded. Beautiful solutions of space and good selection of elements. Congratulations. I really like it here. Love !!! very beautiful indigo blue with white.